The Quinnipiac men’s hockey team pushed their way into the Quinnipiac record books on Saturday afternoon against Canisius. Quinnipiac (3-1) tied a program record last accomplished Nov. 25, 2009 against Princeton, recording four power-play goals on its way to a convincing 7-1 victory at the High Point Solutions Arena at TD Bank Sports Center. Also featured in Saturday’s victory was junior Jeremy Langlois who netted the final three goals in the game for the first natural hat trick since Mike Atkinson scored three straight on Nov. 6, 2009 against Clarkson. 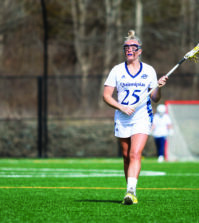 The Bobcats continued to dominate in the first period this season, with two more goals against Canisius (0-1) they have outscored their opponents 7-1 through four games. Kellen Jones knotted the first goal of the game and his first of the season on a sniper shot in front of the Golden Griffin goalie Dan Morrison. The goal was set up on a puck played down to the right of goal to Connor Jones, who passed back to defender Zach Davies near the faceoff circle. His pass across the middle found Kellen Jones and his shot deflected off the post and in for a 1-0 lead. After the Bobcats won the first faceoff off a Canisius penalty, the puck was passed down to Connor Jones from John Dunbar. The sophomore winger played it back out to Loren Barron halfway between faceoff circle and blue line. He moved to his right and setup a rocket shot that beat Morrison low and to the left for a 2-0 Quinnipiac lead. Quinnipiac netted their second power play goal and a 3-0 lead at the 2:06 mark of the second period. A cleared puck turned into transition offense for the Bobcats. Zach Tolkinen possessed behind the net and located a streaking Langlois near the Canisius bench. He raced past to oncoming defenders at center ice and took slap shot at the left faceoff zone. His shot deflected off Morrison’s pads out in front to the waiting stick of Scott Zurevinski who found the back of the net for his first goal of the season. 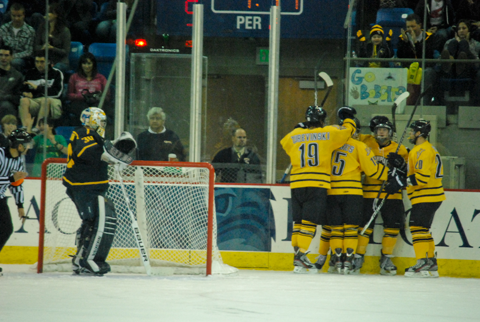 The Bobcats continued to pour it on the Golden Griffins with another goal early in the second period. Mike Dalhuisen intercepted a pass at center ice and found Ben Arnt who slipped past the Canisius back line. Arnt converted his breakaway attempt as he setup a forehand wrist shot that slipped between Morrison’s legs and led to a 4-0 Bobcats advantage. The Golden Griffins spoiled the potential shutout for Bobcat goaltender Eric Hartzell midway through the second period. Canisius streaked up the left side boards and fed a pass across ice to Kyle Gibbons whose shot near the left post squeaked past Hartzell for a Golden Griffin goal. The goal deficit didn’t remain at three for long as the Bobcats scored their third power play goal on the afternoon. Quinnipiac used the one-man advantage to work the puck around the right side of the ice. After a couple initial shots from Davies and Zurevinski, the puck landed out in front on the stick of the Langlois. His right-handed slap shot found the back of the net and Quinnipiac reclaimed a four-goal lead, 5-1. Quinnipiac’s continued offensive pressure lead to a five-on-three advantage late in the second period. Less than 30 seconds into the penalty, the puck swung around to Connor Jones who possessed to the left side of the goalie. His pass in front of Morrison made it through the crease to the Bobcat’s leading goal scorer, Langlois. The junior forward one-timed a shot past Morrison for his fourth goal of the season and into Quinnipiac record books as it tied the school record for power play goals in a game with four. The Bobcats just missed eclipsing the record as Russell Goodman fired a slap shot from the blue line with less than four seconds remaining on the final Quinnipiac power-play attempt early in the third period only to be denied by a Morrison save. Hartzell was pulled at the 3:41 mark for netminder Jake Whiting. This was the first collegiate action for the walk-on senior in what is his first year with the team. Langlois struck one more time for his first career hat trick late in the third period. 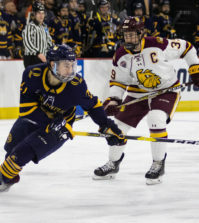 Freshman forward Matthew Peca skated past the Canisius defenders and dumped off to Langlois trailing the play in front of Morrison. The one-timer beat Morrison glove side for his third capper of the game. Among the leading scorers for the Bobcats on the afternoon, Langlois led the way with the hat trick and an assist. Connor Jones chipped in with three assists and Zurevinski recorded his first two points of the season with a goal and assist. The Bobcats will take the ice against Canisius again on Sunday as they look to extend their three-game winning streak. Check out pictures from the game here.